The CNPS Vegetation Program has been working on multiple field projects this year in desert, grassland and wetland habitats. Most recently, we initiated a pilot watershed assessment project in both the San Bernardino and Plumas National Forests focusing on plant community surveys and stream health within fens and meadows. The most striking and intriguing plants we found in the Plumas National Forest were two carnivorous species: roundleaf sundew (Drosera rotundifolia) and California pitcherplant (Darlingtonia californica). Generally in the Plumas, these plants are found in the same fen but do not grow together. One explanation for their separation is that the pitcherplant tends to grow in clumps over a thatch of dried stalks, creating a solid ground cover. Although these carnivorous plants absorb nutrients from other living organisms, they also photosynthesize. Thus, dense stands of pitcherplant may be unfavorable for the smaller sundew due to the lack of light. The roundleaf sundew is often found growing together with Sphagnum spp. and other mosses. This co-occurrence may also support the hypothesis of light competition, since mosses and sundew are similar in size and stature and typically do not shade each other. 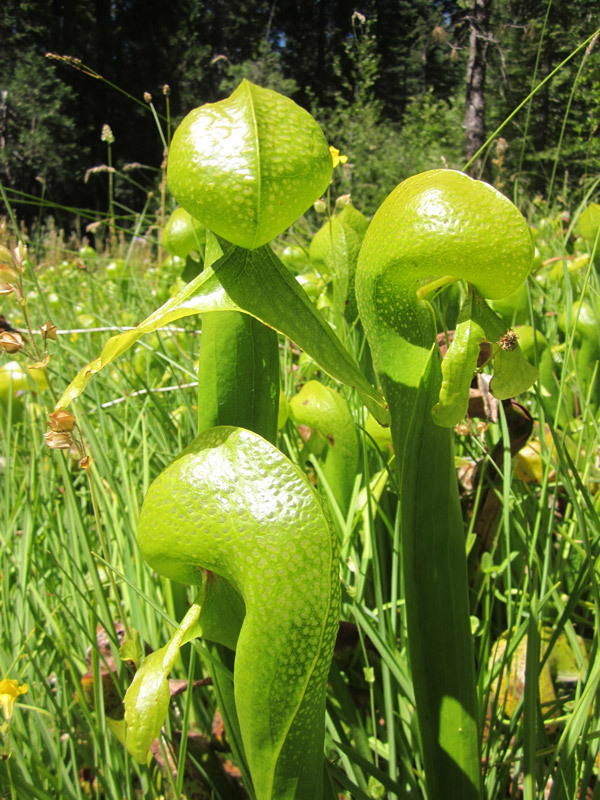 The recent documentation of carnivorous plants has increased our knowledge of the plant communities these species occur in; over the past few years, CNPS has surveyed 30 meadows in California with carnivorous plants. 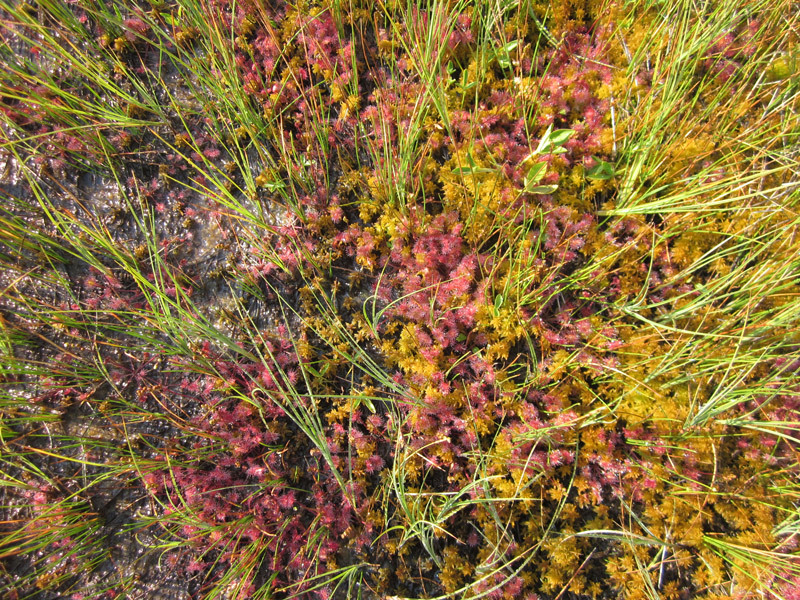 Associated species of communities co-dominated by sundew include Sphagnum spp., buck bean (Menyanthes trifoliata), Northwest Territory sedge (Carex utriculata) and mud sedge (Carex limosa). In plant communities where sundew had low cover, we found mountain laurel (Kalmia polifolia), Sphagnum spp., tundra aster (Oreostemma alpigenum) and star sedge (Carex echinata). California pitcherplant (Darlingtonia californica). photo by Scott Batiuk. In dense pitcherplant stands, we often saw common yellow monkeyflower (Mimulus guttatus), sedge species (Carex spp.) and western false asphodel (Triantha occidentalis). Where pitcherplant has low cover, we noted pinnate-leaved lotus (Hosackia pinnata), sedge species (Carex spp.) and rush species (Juncus spp.). While walking in the meadows, we struggled through floating fens and saturated peat in our heavy rubber boots, wishing the carnivorous plants would eat more of the mosquitoes and biting flies. 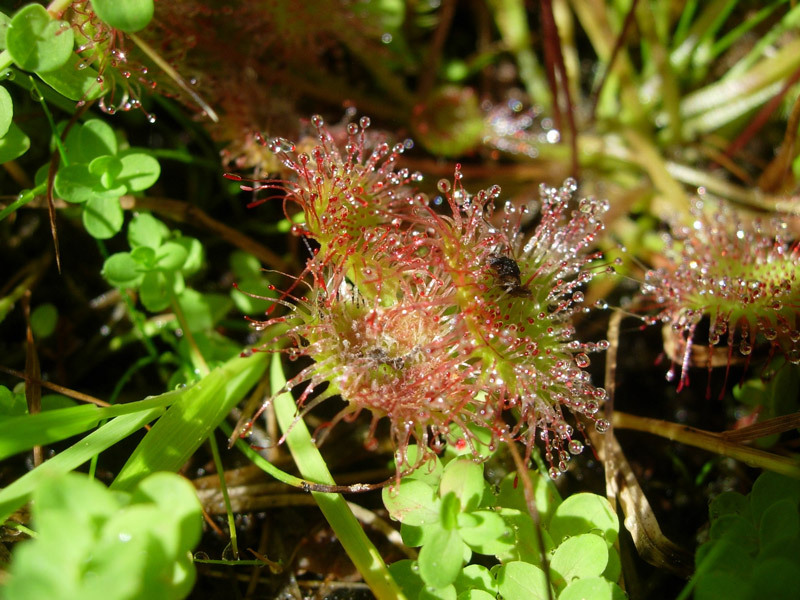 To see our carnivorous friend, roundleaf sundew (Drosera rotundifolia), digest blood-sucking insects watch the following video. Regardless of their efforts to keep us from harm, carnivorous plants are always captivating; pitcherplant with its comical mustache (evolved from a leaf mutation) and roundleaf sundew with its circular leaf blade (laminae) covered with long, red, sticky tentacles (used to trap and digest prey). Both species have produced fascinating research and hypotheses on the evolution of non-carnivorous plants to carnivorous plant species. As field botanists, seeing these unique species in the wild reminds us of the complex, evolutionary processes that plants have sustained since the beginning of time. It gives us hope that plants will survive and evolve, even through extreme environmental conditions and changes. Nevertheless, it is only through research, education and stronger wetland protections that dwindling fen and meadow communities will be preserved along with the carnivorous plants that grow within them. Through these measures, we hope to maintain healthy populations and a unique genetic resource into the future. Most importantly, we hope that they evolve to eat more mosquitoes.